Evidence has again emerged indicating that if Western mainstream media actually reported more on the sufferings of Christians throughout the Islamic world, their lot would likely improve. In an interview with The Times newspaper, British Prime Minister David Cameron described the ruling as "barbaric" and out of step with today's world (emphasis added). Of course, soon after the BBC reported that Ibrahim would be freed, other reports appeared indicating that that is only a rumor—one that the BBC, which regularly tries to minimize the specter of Muslim persecution of Christians, jumped on—that Sudan was merely trying to save face before the international community. According to the imprisoned Christian woman's husband: "No Sudanese or foreign mediator contacted me. Maybe there are contacts between the Sudanese government and foreign sides that I'm not aware of." At any rate, why did Sudan say Ibrahim was going to be released? After all and despite what Sudan's under-secretary says—that "Sudan guaranteed religious freedom and was committed to protecting the woman"—Khartoum's Islamist government upholds Islam's apostasy law, which actually guarantees that born Muslims do not have "religious freedom." 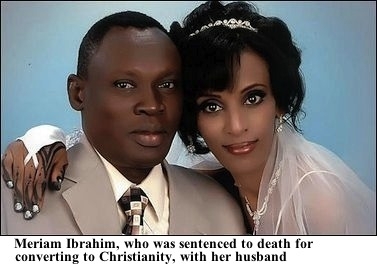 As just one example, back in June 2012 in Sudan, a Muslim woman divorced her husband after he converted to Christianity. The court automatically granted her custody of their two sons (according to Islamic law, children of divorced parents are to remain with the father, but if the latter is an apostate, they go to the mother). When the father tried to visit his children, his ex-wife threatened to notify authorities. "They might take the case to a prosecution court, which might lead to my sentencing to death according to Islamic apostasy law—but I am ready for this," the Christian man had said. "I want the world to know this. What crime have I done?" And that's the whole difference: "the world" did not "know this," whereas the major media did report on Ibrahim's plight, thereby exposing Sudan to international condemnation. Precedents of this phenomenon—international outrage prompting Islamist governments to rethink their abuse of Christians—have occurred in other Muslim countries. For example, back in September 2012, two other Christians under arrest and awaiting execution in the Islamic world—one, like Sudan's Ibrahim, charged with apostasy in Iran, the other with blasphemy in Pakistan—were also released, but only after much widespread international condemnation, that is, only after the mainstream media exposed their plight. A Christian pastor sentenced to death in Iran for apostasy was reunited with his family Saturday after a trial court acquitted him… Pastor Youcef Nadarkhani, born to Muslim parents and a convert to Christianity by age 19, was released after being held in prison for almost three years under a death sentence…. His case drew international attention after his October 2009 arrest, and the 34-year-old pastor refused to recant his Christian beliefs (emphasis added). Right around the same time, Pakistani authorities released a teenage Christian girl accused of blasphemy and facing the death penalty. Up till then, local Muslims had insisted that 14-year-old Rimsha Masih be put to death, warning that, if released, they would "take the law into their own hands." Her case also reached the international community, sparking widespread outrage and condemnation of Pakistan. The point here is that such prisoners of conscience are not released because their respective governments suddenly decided to act according to universal standards of human rights. If so, they would not have arrested the accused in the first place. Nor should such releases suggest that Afghanistan, Iran, Pakistan, or Sudan are rethinking Islam's apostasy and blasphemy laws, which prescribe the death penalty. After all, there are countless more Christian "blasphemers" and "apostates" rotting on death row in all three countries, not to mention all around the Islamic world. As with Sudan, Christians in the aforementioned countries are habitually persecuted, imprisoned, and or killed. In Crucified Again: Exposing Islam's New War on Christians, Iran's persecution of apostates to Christianity is so widespread that it warrants a special "spotlight" section; Pakistan also gets a special spotlight section for its frequent arrests and imprisonments of Christian "blasphemers." Indeed, just days ago a Christian couple in Pakistan, one illiterate the other disabled, received the death sentence for allegedly sending "blasphemous" text messages. However, unlike Sudan's Ibrahim, Iran's Nadarkhani, Pakistan's Masih, and Afghanistan's Rahman, the Western mainstream rarely if ever hears about these many unfortunates. Unlike the many faceless Christians persecuted all around the Islamic world, the Western mainstream media actually reported on these three, prompting public outrage, international condemnations, and in some instances the threat of diplomatic actions and/or sanctions. For Sudan, Iran, Pakistan, and Afghanistan such "infidels" were simply too much of a liability to punish as Sharia demands—the same Sharia, incidentally, that teaches Muslims to be lax and tolerant when in their interest, such as when the international community puts them in the spotlight. Thus such freed Christians are a reminder of the important role the Western mainstream media can play in alleviating the sufferings of minorities throughout the Islamic world. For if they were not reported on—as the overwhelming majority of persecuted Christians are not reported on—they would surely still be in prison on death row, where so many other nameless and faceless Christians remain. So consider the impact the mainstream media could have if they were to report the full truth and extent of Muslim persecution of Christians; if they stopped portraying the few they do report on as anomalies but rather as the tips of a very big and ugly iceberg. The fact remains: the overwhelming majority of people in the West remain woefully ignorant of the sufferings of non-Muslims under Islam, thanks to the mainstream media's general indifference or worse. However, as precedent suggests, when enough people in the West do hear about them, they do act, prompting their governments and human rights groups also to act, prompting Islamist governments to realize that persecuting this or that Christian is simply not worth it. In the case of Sudan's Meriam Ibrahim, time will only tell if the major media will forget about or try to dismiss her story—as the BBC may be doing—or whether they will continue exposing the truth of her plight, which, at this point, is likely the only way this wife and mother who refuses to renounce Christianity for Islam can ever hope to escape execution. Raymond Ibrahim, a CBN News contributor, is author of Crucified Again: Exposing Islam's New War on Christians and The Al Qaeda Reader. He is also Shillman Fellow, David Horowitz Freedom Center; Judith Friedman Rosen Writing Fellow, Middle East Forum; and Media Fellow 2013, Hoover Institution.